This is a compilation of TNT unli call promo, the promos listed here are of different amounts, time of call, validity, and much more. So, why did I think of this? After checking the webmaster tools, I've found out that most TNT subscribers are looking for unli call promos, but no blog can give the right answers to your queries. Therefore, I conducted a research about the latest and working unli call of Talk N Text. UTNT - The best unli call promo of Talk N Text, it also has unli text. For P10 only, you'll get both features. For Talk N Text subscribers only. 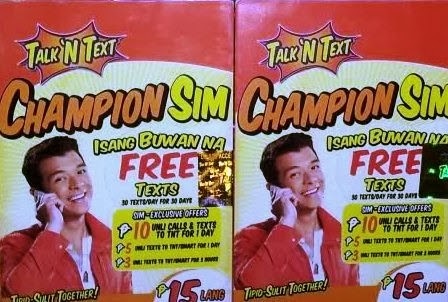 Important note: For Talk N Text champion SIM only, like the picture below. AP20 4545 - This promo will have not SIM restriction, but only a limited time frame. Anyways, AP20 will not only have unli call, but also unli text for only P20. Note: The unli call can only be used at 10am to 10pm and 12nn to 6pm. How to call: Dial *4747 + 11 numbers of TNT/SMART friends. TNT Unli Talk Plus 20 - For P20, you'll have 1 day of unlimited call at a particular time only, almost the same as AP20, also with unlimited text offer. How to call: Dial *4547 + 11 numbers of SMART or TNT subscriber. T100 - 5 days unlimited call to Talk N Text and SMART subscribers, this promo has also a particular time frame which you are allowed to call. How to call: Dial *4547 + 11 digit of TNT/SMART numbers. UnliTalk20 - Avail 1 day unlimited call to SMART/TNT without any time requirements, but only limited to few Talk N Text partners. How to call: just call the number directly, no particular prefix needed. Note: Only available for 6 TNT or Smart subscribers. These list are the most used and most affordable promo as of now. Will update this post when a new unli call promo is announced by Talk N Text. Thanks! It help to me. I do hope this UTALK20 is okay. try to use GU15 send to 3545.. if applicable in your area..
bkit d nmn pd itawag ang tnt AP20 sa SMaRT?! ano ba yan! wala naba ang KATOK10 or KATOK15? Panu ung Talk N Text champion SIM? Nabibili ba yan or kelangan mo lang iregister ung sim mu? ung AP20 hindi makatawag sa smart ang daya ah nakalagay pwede sa smart at TNT taz nung tumawag ako sa smart nagtxtTNT lng daw pwede tawagan anu ba yan!!!!! npaka panget andaya nman neto.ansv s AP20 10am-10pm..... nung ngregister aku ang nkalagay na 10pm-10am anu nman matatawagan ku ng 10pm!!! !....i thought 10am kc un ung nakalagay d2!!!! gumagana pa po ba ung UTNT ? panu stop ung service ng ap20? Is UTALK20 promo just a hoax? It is always unavailable! Can u give the details of such promo (e.g. the available time to register)? Nkakainis nman yun AP20! Akala ko ba for tnt&&smart! E bat nun tnawagan ko ang smart number hnd pde . Kelangan tnt lng . Ano yon? I ppromo nyo ng ganon , tapos hindi nman pla pwede ..
bakit hindi ako makaregistered ng T20,,may bagong promo ba ngaun na UNLICALL?? PANLOLOKO LNG LAHAT TO! DITO SA AMIN, YANG BWISIT NA T20, HINDI MO MAGAGAMIT, SERVICE IS UNAVAILABLE LAGI! WAG NYO NANG LOKOKHIN ANG MGA CUSTOMERS,PLEASE LNG! KUNG EXPIRE NA YANG LETSENG PROMO NYO,ALISIN NYO NA! bakit hindi ako maka registered ng UTNT? ?